The first three of Richard Foreman’s brilliant recreations of the classic Raffles stories are collected together in a single volume. 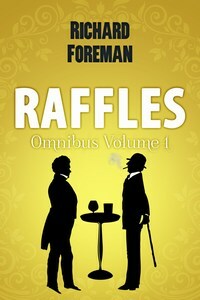 Raffles, the famous cricketer and amateur cracksman, is back in an original adventure. Harry “Bunny” Manders, Raffles’ biographer and accomplice, recounts the tale of the time they broke into the bookshop, Hatchard’s of Piccadilly. Their mission? To steal a letter, formally owned by one Rene d’Aramis, which if published could compromise a prominent member of the government. Yet, even more intriguing than their employment is their employer – a certain Mr Sherlock Holmes of 221b Baker Street. How will the master criminal fare against the legendary detective? In this stunning re-creation of the classic Raffles stories, Richard Foreman brings one of the most famous characters in literature vividly back to life. Raffles and Harry “Bunny” Manders are back, in this thrilling sequel to Raffles: The Gentleman Thief. Raffles decides to undertake a job close to home, at the Albany. His new neighbour is Rupert Robert Fuller, a powerful – and odious – financier. In order to distract Fuller, whilst he breaks into the banker’s opulent apartment, Raffles calls upon his friend – the cricketing legend C.B. Fry. Yet how much is Raffles being distracted himself Mary Flanagan, Fuller’s beautiful and enigmatic maid? Has someone finally stolen the gentleman thief’s heart? Raffles The Gentleman Thief returns in this magnificent third instalment of Richard Foreman’s new series based upon the adventures of one of the classic characters of British fiction. In Raffles: A Perfect Wicket, Bunny is worried for his great friend. Since the disappearance of Mary Flanagan (the events of which are contained in the story Raffles: Bowled Over) Raffles has grown despondent, sick with boredom. Thankfully a remedy is found, in the form of an invite to a party. The host is Lord Rosebery no less. Raffles considers the opportunity to be “a perfect wicket” in terms of the the spoils to be had, and hatches a plan to rob the former Prime Minister. Yet Lord Rosebery has also invited another guest up from London, a senior policeman, who confesses to Bunny that he has been tipped off that a notorious burglar will be attempting to rob the house over the weekend of the party. ‘A capital story! Strong characters, sparkling dialogue, a plot with a twist as the gentleman thief plies his trade again. Devotees of the original stories will rejoice at his return: new fans will greet a fresh hero and wait impatiently for more adventures. Raffles, burglar extraordinaire, master cricketer, welcome back to The Albany!’ David Dickinson, author of The Lord Powerscourt Mysteries. This brilliant volume of three novellas will appeal to readers of the original Raffles stories, devotees of Sherlock Holmes, traditional detective stories, and fans of historical and cricketing fiction. Endeavour Press is the UK’s leading publisher of digital books.